In order for the plants in a greenhouse to continue growing rapidly during the summer months, a greenhouse gardener needs to make sure that the temperature within the greenhouse doesn’t get too hot. 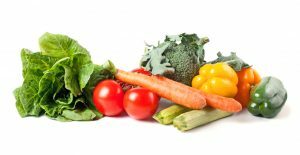 There are a few different ways that greenhouse growers can maintain cooler temperatures during the heat of summer. A grower usually chooses a cooling method based on the size of the greenhouse and his or her budget. The most common types of cooling devices used in greenhouses are based on water evaporating, which cools the air within the growing space. The most commonly used systems are wet wall systems, portable evaporative coolers, foggers and humidifiers. Wet wall systems are the most popular and efficient way to cool large, commercial greenhouses. These systems consist of cooling pads encased in an aluminum housing. The aluminum housing appears similar to a honey comb. The honey comb design allows air to pass over the cooling pads which are kept drenched in water. The air is cooled significantly as it passes through the wet pad on its way into the greenhouse, much like a radiator cooling an engine. After entering the greenhouse, the evaporative effect cools the growing space. The powered fans (placed on the wall opposite the wet wall system) are the driving force for the air movement. The motorized shutters that allow air to enter the greenhouse are thermostatically controlled to open and close as determined by the temperature. Wet wall systems are fairly expensive and more elaborate in their installation. This is because the water used in a wet wall system is continuously recirculated and requires a fair amount of plumbing. Because of their expensive and more elaborate design, wet wall systems are usually only used in larger commercial greenhouses. Portable evaporative coolers are a cooling device that is much more commonly used by home hobbyist greenhouse growers. Portable evaporative coolers are completely self-contained, movable, and relatively inexpensive ($500-$1000 depending on size). 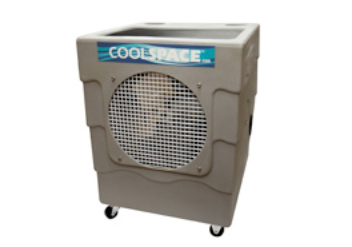 Portable evaporative coolers contain a similar pad to that used in wet wall systems. Like wet wall systems, air is drawn in and forced over the wet pad to create an evaporative cooling effect. Portable evaporative coolers usually contain a float valve and are connected to a garden hose to maintain the water level in the tank as the water evaporates. Portable evaporative coolers work best when they have access to fresh air. In other words, for the best effect, portable evaporative coolers should be placed near the greenhouse entry or a fresh air intake vent. Portable evaporative coolers are thermostatically controlled and can easily be stashed under a bench or out of the way when not in use. Portable evaporative coolers are a great way for home hobbyist greenhouse gardeners to maintain cooler temperatures during the hot summer months. to keep a hobby greenhouse cool. For small hobby greenhouses, a fogger or humidifier can serve as an evaporative cooling system. A fogger is a device that emits water in a fine fog. These devices can be placed directly behind a circulating fan to blow the water-cooled air around the greenhouse. As the water evaporates, it creates a cooling effect. A humidifier found at a big box store can be set up in a similar fashion. When placed behind a circulating fan, the cool moist air can be blown across the greenhouse for an evaporative cooling effect. Both foggers and humidifiers emit water droplets so small that the plants within the greenhouse will not get wet. Instead, the water quickly evaporates and cools the greenhouses climate in the process. 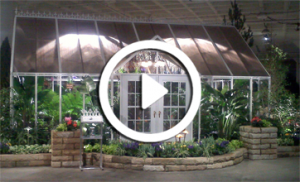 When discussing cooling systems within a greenhouse, some gardeners ask about mist systems. Although a mist system will cool a greenhouse, they are generally better suited for irrigation. The water droplet size from a mist system is much larger than that of a fogger or humidifier and this causes the plants to actually get wet which can create a whole new series of moisture related problems during the hot summer months. By maintaining temperatures within the desired range for plant growth, a greenhouse gardener can ensure that he or she maintains vigorous growth even during the peak heat of the summer months. Whether a gardener is attempting to cool a large commercial greenhouse with a wet wall system or a small hobbyist greenhouse with a portable evaporative cooler or a humidifier, evaporative cooling is the best way to ensure that the plants beat the heat of summer.